It's no coincidence that many great British sitcom actors of our age tend to be theatrical stars rather than movie stars. The likes of Paul Eddington, Nigel Hawthorne, Penelope Keith, Peter Bowles and Felecity Kendall were rooted in the British theatre. Sitcoms, especially studio audience ones, are probably more like theatre than any other medium. The tone and tempo are similar - and the audience are asked to buy the contrivance of a set, which never quite passes for 100% real. Reality is heightened, time is compressed and then there is the sound of audience laughter - which you really do not get in real life. At least, I don't. 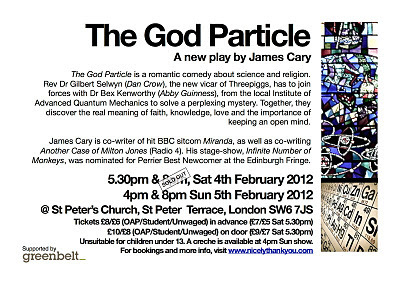 This link with the theatre poassibly explains why I've had a lot of fun writing a play called The God Particle. Apologies for the shameless, thinly disguised promotion of it on this blog, but there it is. Come and see my play. 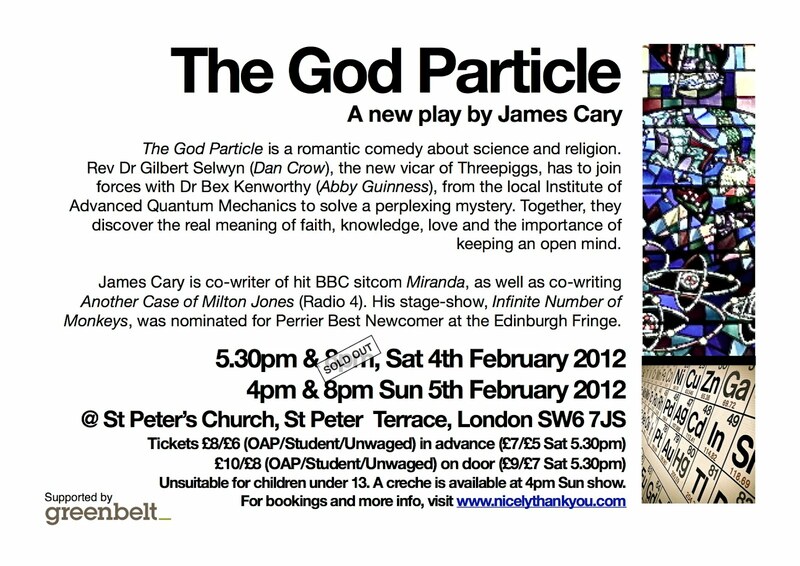 It's on at St Peter's Church in Fulham on 4th & 5th Feb. Details below. 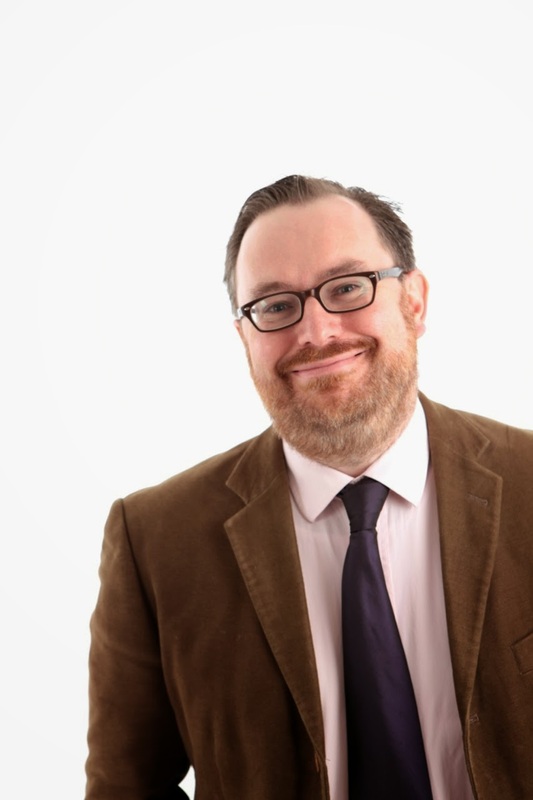 It's a romantic comedy about a vicar and a quantum physicist who are brought together by circumstances, and they bicker and argue about life and religion like Maddie and David from Moonlighting. It's all based around a quotation by one of my favourite writers, GK Chesterton who said "The point of having an open mind is the same as having a open mouth: to close it on something solid." This sounds witty but is it true? The scientist would argue not. What is it to have an open mind? Does that mean never believing anything? The play looks at all that. With jokes. The Saturday night 8pm show is already sold out. 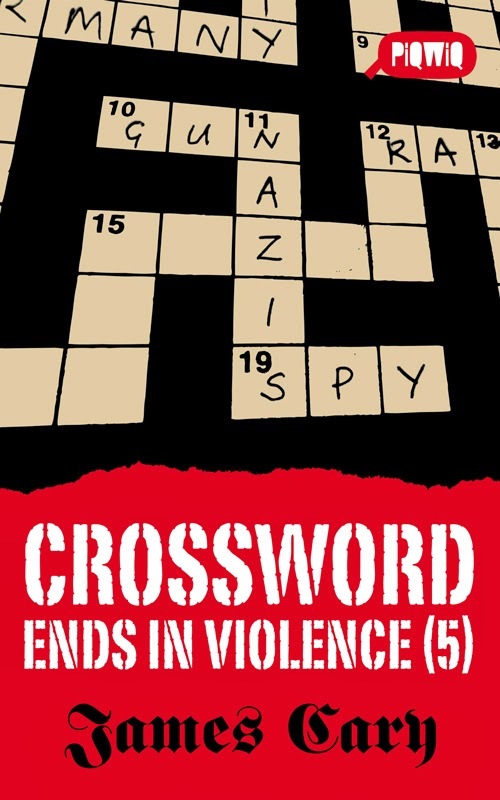 There are three other shows, though, at 5.30pm on Saturday 4th February (book here), and 4pm (here) and 8pm (and here) on Sunday 5th February. There is one more date in Burford, Oxon on 18th Feb (here). Here's my experience of show titles. A title for the show turns up at the very beginning, or you're really going to struggle to think of one you like. I have a few shows swirling around at the moment. One has a working title that needs to be changed. And another has a title that I don't like any more. Trying to re-title a show is very very hard for a reason I can't quite fathom. With my radio projects, titles just turned up early on in a fairly pleasing way. Think The Unthinkable was the show title from very early on and conveyed a sense of people advocating change purely for its own sake which is what the show was essentially about. My Bletchley Park sitcom, Hut 33, came along quite easily. Early versions of the show were called Hut 6 (where the likes of Alan Turing worked during World War Two), but then I realised out of respect for those hero-boffins, I wanted a hut that didn't exist and was clearly full of also-rans on the edges. Hut 33 scans quite well and, after I chose it, realised it subconsciously reminds you of of Catch 22. No bad thing (even though Catch 22 is a comedy, but it's such a cultural icon, it feels safe to refer to it in that way). My other short-lived/failed radio sitcom, The Pits, equally came at the start - about musicians in an orchestra pit who were discontent with their lot in life. In general, it's a nightmare if you have to spend too much time on it. You need a title that sounds exciting and intriguing and is distinctive, but not too weird. But not too bland. I have to say 'New Girl' is a really bland title for a very quirky and interesting show. Felt they could have pushed that harder. But what do they care? The show's a hit. How do others find this who area of thinking up titles? What are the rules? What are the notable failures, or resounding successes? Thanks to iPlayer (possibly the best use of licence fee money since hiring David Attenborough in the 60s) I finally managed to watch the new BBC1 sitcom, The Royal Bodyguard. I'd tried to avoid too much press before seeing it myself, but saw that some people were saying slightly curious things about it, comparing it to Jonny English, as if that were a bad thing. Daft physical comedy is the oldest, most enduring, most globally successful kind of comedy there is (ask multi-millionaire Rowan Atkinson). Some people just don't like that kind of thing. Fair enough. It's also worth bearing in mind that The Royal Bodyguard is written by Mark Bussell and Justin Sbresni, who wrote the excellent Worst Week of My Life. 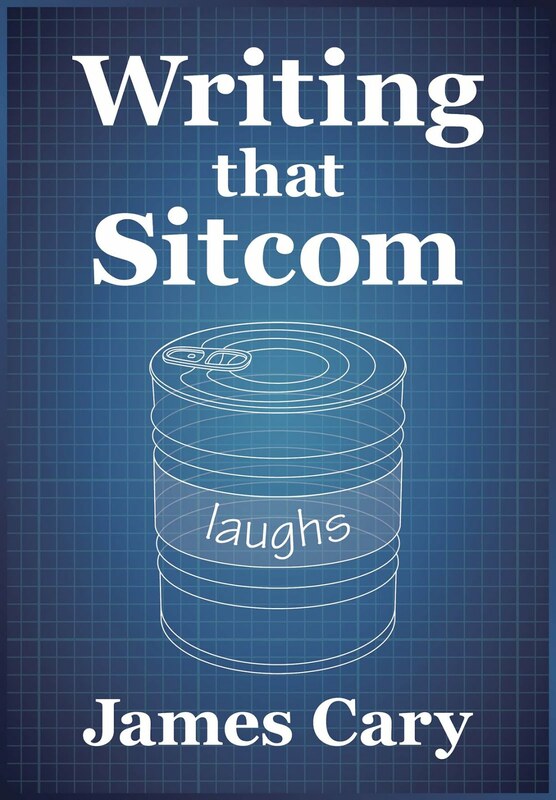 They have proven that they are decent writers, especially of farce and physically comedy - and are more successful than sitcomgeek. Noted. Caveats done. So what did you think? I saw Episode 1 and I'm not into it yet. It's early days, and my concerns with it may well end up being addressed. Here's my main observation. The show is all about the central character. Completely and totally. Other characters in the show are all played very straight - even the wonderfully funny Neil Edmond, and the cartoonish villains. I personally would have made the peripheral characters funny and given them lots of jokes. Geoffrey Whitehead really knows how to nail a joke, so its a pity he didn't have much to get his teeth into. Now because the writers are good, the star of the show has nothing to prove as a comedy actor, and the production company are the mighty Hatrick, there must be some reason as to why all involved are not being carried shoulder-high through the streets of Shepherd's Bush. It feels like it was a conscious decision to focus the comedy on the central character, so the pressure is all on David Jason as the Royal Bodyguard to do every single one of the show's jokes. To sustain that level of scrutiny, the character needs to be completely watertight. But water is, I fear, seeping in. Or out. (which every is the bad way round). So who is this Hubble character? My main beef is that after watching him for half an hour, I still don't really know. I'm not after backstory. (Remember, backstory is comedy death) I need to understand what he wants. Is he incompetent, stupid, clumsy, unprofessional, hapless or out of his depth? These all overlap, but they're not the same thing. And when we meet the character for the first time, we form our initial impression of him. And here is a confusing signal because at the very beginning, the Queen is getting into the coach. He picks up a crisp packet and explodes it in the face of a guard. Really? What an extraordinary thing for even a lowly royal car park attendant. He must be a really prankster. Or a live wire. Like Jim Carrey as Ace Ventura. Or massively unprofessional - in which case he wouldn't try to rescue the Queen. Who is he? His exchange with the Hotel guy (Neil Edmond) doesn't quite establish him. We don't know whether he realises he's been massively overpromoted or not. It would be useful to clarify that. One way to go would be to make him pompous/Mainwairing-like and think its about time he was in charge, and this will give him the respect her craves. This could explain why he genuinely thinks that female assassin is attracted to him, because at the moment, that bit feels implausible. He would surely realise that he, as head of security, is a prime target for a femme fatale? He is obviously fairly stupid. But how stupid? It sounds picky, but again, it would be useful to know exactly how stupid or, indeed, why he is so stupid. What desire or life-goal is hampering his judgment to badly? We encounter different types of stupid in the same show and we can tell the difference - think about Kramer, George and Newman in Seinfeld. In Dad's Army, Pike is stupid because he's young. In Allo Allo, the policeman is stupid because he's foreign/English. People often appear stupid ebcause they want something. What is it? In the hotel room, Hubble seems surprised by someone who is obviously a hotel porter and a maid in the bedroom. Is he really that stupid? It's okay if he is. Very stupid is funny. But then he later, he correctly realises that leg of the assassin was different (and this thought is not triggered by anything). So he's not that stupid? And yet this is the man who didn't realise he was being seduced. And somehow didn't feel his key being taken from out of his sock. Now I couldn't answer any of these questions in the case of Johnny English and/or Inspector Clouseau. And yet it feels like Atkinson/Sellars know in their hearts what their characters are like and what really makes them tick. And when The Royal Bodyguard really shows us who Hubble is, what he wants and why he can't have it, we'll have some serious comedy on our hands.